Taken from Koigu Magazine - Spring 2011: "An all over lace shawl in a leaf pattern with a wide leaf border." 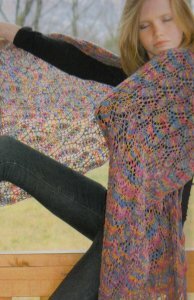 This pattern is in Koigu Magazine - Spring 2011, page 51. Size US 6 circulars (or size needed to obtain gauge) is required but not included. Finished Measurements: 23.5" x 92" with border after blocking.